Solar power is just one aspect of the growing eco-friendly, environmentally-conscious, green building ethos. There are many ways to incorporate green building into your log home construction, beginning with clever log cabin home design and site preparation. 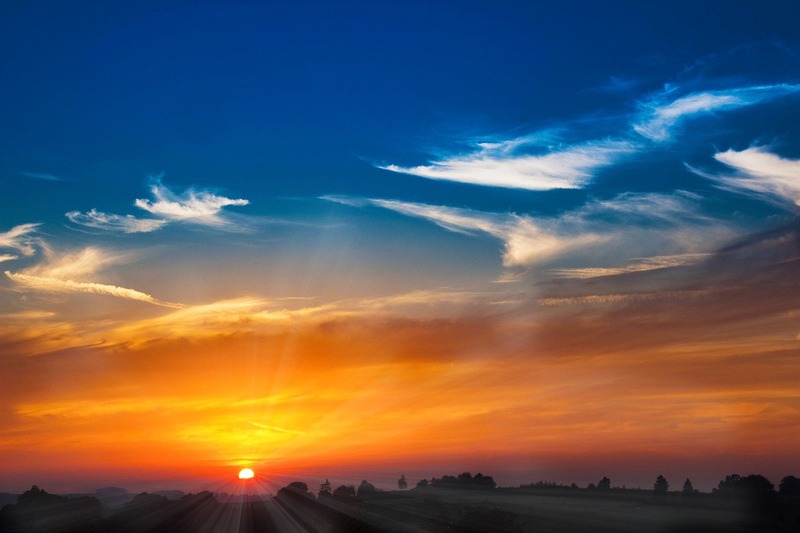 There are two kinds of solar energy: passive and active. Siting your cabin correctly on the lot to take advantage of solar warming in the winter and to avoid the sun’s heat in the summer. Utilizing heavy stone, concrete or wood elements inside the house in the path of the sun to absorb the heat and hold it, like a heat bank. Using long roof overhangs to block hit summer sun but allow in the winter sun when it’s lower on the horizon. Using light colored cabin roofing in the south to help reflect the summer sun, and installing a reflective barrier to block the radiant heat from the sun. Building with logs – a natural heat absorber with “thermal mass”. Using energy efficient cabin windows (pick from this chart from the Efficient Windows Collaborative) with a low U-value (U-value is the inverse of R-value, so a low U-value means a high R-value) and a high SHGC (Solar Heat Gain Coefficient). Adding porches to shade sunny sides of the house and reduce summer heat gain. Active solar refers to using pumps, motors and controls to move sun-heated water or using photovoltaic (PV) cell solar panels to generate electricity. Solar-heated water is one of the cheapest and easiest ways to use active solar power. The initial installation involves placing several panels on the roof that are oriented towards the sun. These have fluid in them that is heated up from the sun and cycles to a holding tank where the hot fluid transfers it heat to water. These solar water heater panels are lightweight and easy to handle, typically 2' x 2', that can be threaded together to create the capacity needed. This hot water can then be used to heat the house by circulating through PEX tubing under the floor or used directly as domestic hot water. What happens in the summer when I don’t need all that hot water? Solar water heaters utilize a by-pass or an energy dump to dissipate the heat generated. Sometimes a solar water heater will simply be shut down so no water gets heated when you don’t want it. What about reverse-cooling at night? The simplest design for solar water heaters uses a drain-back system where the fluid in the panel drains back automatically when the temperature reaches a certain point. This keeps the fluid from circulating and drawing away the heat from your water tank. Do I have to worry about freezing in the winter? Fluids used in the solar water heater have additives to keep them from freezing, generally ethylene glycol (similar to what’s used for winterizing an RV) – not the poisonous propylene glycol used in automotive anti-freeze. In warm southern climates you may be able to use straight water with no fear of freezing. Using thermostats, controls and quiet DC pumps, solar water heaters automatically heat your water and your house with free energy from the sun. The relatively high initial cost can be justified by calculating the pay-back period – the time it takes you to recoup the costs of installing the system versus the amount of money you would pay normally for heat and hot water over the same time frame. Another active solar energy application is using photovoltaic cell or PV panels. These are the traditional solar panels you might have seen installed on a roof but the technology is changing rapidly and you may not always be able to tell when you see a solar cell panel. Some companies are developing thin-film solar technology in sheets that can be rolled out, or implanted into roof shingles so that your entire roof becomes a solar energy collector. 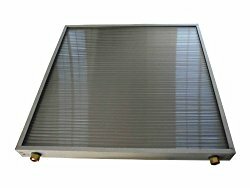 Thin-film solar collectors like these are slightly less efficient so you need to have a larger array to collect the same energy as rigid solar panels. The only real downside to PV solar panels is the high initial cost. The panels themselves are extremely reliable and last for many years with little to no upkeep. There are government rebates and programs available to encourage the use of solar panels and you can look up your area on DSIRE: Database of State Incentives for Renewables & Efficiency. PV solar cells generate DC or direct current voltage. Homes use alternating current or AC voltage. You need to use an inverter to convert the voltage to usable energy. An inverter does just what the name says: it inverts the wave, changing flat DC voltage to alternating voltage. There is a wide range of inverters, including small 300-watt inverters you may have used that plug into your car cigarette lighter and convert the DC voltage from the battery to usable AC voltage for your computer. Obviously for a house inverter you need one more substantial, like a 3000-watt modified sine wave inverter. You also need to be careful how closely the inverter mimics standard AC voltage. Some appliances like bread machines won’t work unless the sine wave is very consistent. Good quality inverters will transform your solar-panel generated DC power into usable house power without a hitch. You can carry on your regular lifestyle with virtually no changes. 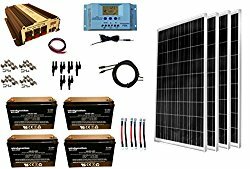 If you're looking for a simple solution for supplying alternative energy for you cabin needs, you can buy complete solar power system kits that have everything you need, all designed to work together. This is easier than buying your parts piecemeal and assures you that everything will work well together for your off-grid cabin. 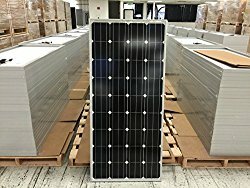 How much does it cost to set up a solar power array? 30 years ago the cost of installing solar power was over $6 per kWh (kilowatt-hour). In today’s market, state incentives and price efficiency reductions have reduced that figure to roughly $0.10/kWh, a drop of about 98%. The cost continues to drop with advances in technology. In addition, this amount is the cost of your electricity that you have locked in for the next 30 years, while standard electricity prices will continue to increase. According to the National Appraisal Institute (Appraisal Journal — Oct. 1999), your home's value increases $20 for every $1 reduction in annual utility bills, so it makes financial sense to make an investment in solar power to reduce your energy costs immediately as well as increase the value of your home. Log homes already utilize a green, renewable resource by building with logs. You can increase your green credibility and reduce your carbon footprint by adding solar power to your log cabin, whether it’s utilizing passive solar using smart log cabin design tips and careful placement on the building site, or active solar using roof-top mounted water heaters and solar panels.